Indian Spiced Potatoes and "Eggs"
2 green chili peppers, like jalapeno or serrano (minced). Use more or less based on your tolerance for heat. 20 curry leaves (about 2 sprigs). If the curry leaves are large, cut them thinly into ribbons. 3 shallots (thinly sliced). Red onions are fine. Make the tofu "eggs" by first placing the aquafaba in a food processor and processing until very foamy. Add the crumbled tofu along with the cornstarch and garlic powder and salt and ground black pepper to taste. Process until smooth. Set aside. The mixture will be pretty thick, but should be scoopable and spreadable. If you don't use aquafaba, use some nondairy milk to get the right consistency. Heat the oil in a skillet. Add the mustard seeds and when they sputter, add the curry leaves and coriander leaves. Saute for a minute, then add the shallots and green chili peppers. Season with salt and continue to saute for a couple of minutes. Add the cooked and sliced potatoes, trying as best as possible not to overlap. If there is some overlap, do not worry. Let the potatoes cook for a few minutes so they start to brown, then carefully turn them around with a spatula so they can brown on the other side. Make sure at this stage that your potatoes are perfectly seasoned -- add more salt if needed. Using a spoon or ladle, scoop on the tofu "egg" mixture over the potatoes, leaving a one-inch border around the sides. If not using an oven-safe skillet, transfer the potatoes to an oven-safe dish at this point and scoop on the tofu "eggs". Carefully place the skillet or baking dish in the oven. Bake 30 minutes or until the top feels firm to the touch. The tofu "eggs" won't set the way regular eggs would, but they'll be pretty firm and will have a silky, creamy texture when you eat them. 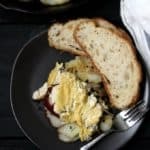 Serve the potatoes and "eggs" hot with slices of crusty bread.